Travel with Kevin and Ruth! : Another giveaway! That's right, we're hosting yet another giveaway, and it starts today! This one will certainly appeal to all of our North American readers who own an RV...fifth wheel, motorhome, travel trailer or truck camper. We've partnered with the good folks over at Harvest Hosts to give away three of their annual memberships valued at $40 each. What's "Harvest Hosts" you ask? Well, we've talked about Harvest Hosts here before. But it's been a couple of years and even though we're not currently traveling with our own motorhome, we strongly believe in the Harvest Hosts program and we want three of our readers to experience it for themselves. 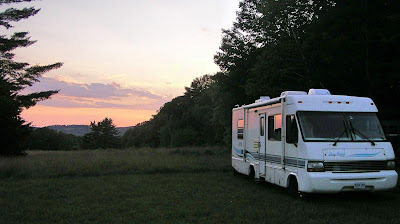 Essentially, they have a database of over 400 wineries, orchards, and farms across Canada and the United States where you can overnight in your RV for free. You can access that database by paying a $40 annual membership fee. 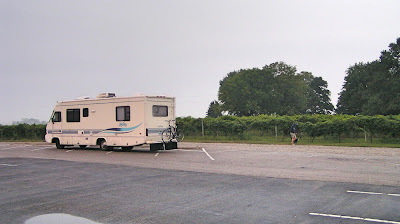 Our motorhome "Sherman" parked up for the night at a winery in Indiana. The idea of course is to overnight at a decent spot while you're traveling. Something better than a grocery store parking lot. Most of the Harvest Host locations are out in the country...quiet, and away from the highway. Whenever we've stayed at one, we've always been graciously welcomed by the host. Usually the owner themselves! Sherman, enjoying the sunset at a host winery in Maine. We even stayed at one in Pennsylvania where we couldn't get in touch to confirm at the last minute. Turns out the owner had been ill, but his wife insisted that we stay, and when we went to buy a bottle of wine from them, she said that she couldn't be bothered opening the cash and just to enjoy it with our evening meal. I think you could even stay at most places more than the one night. If you need a break, and the host doesn't mind. All you would have to do is to ask. There are no services supplied though, so you'll need to be self contained with your own water, toilet, and electricity. So, you get the idea? Has anybody else tried the Harvest Hosts program? We LOVE it and we're so thrilled to be giving away 3 of their memberships. How can you win? Just fill out the simple form above. You can get one entry just by filling in you name and email address. Then, using the form above, there are a bunch of ways you can increase your odds of winning. "Like" Travel with Kevin and Ruth on facebook and you get five extra points! "Like" Harvest Hosts on facebook and you get another five points! Visit the Harvest Hosts website and tell us how many hosts there are for your use. Yep. Another five points. Put a link to Harvest Hosts on your own blog or website and get even more points. So there you have it...you've got just over five days to enter. Next Tuesday, August 6th we'll announce the winners! Sounds like a great prize although I'm unlikely to win it since I don't do facebook for lots of reasons and I also never put commercial links on my blog. BUT I've entered anyway. Hope springs eternal!! Thanks for hosting another giveaway. I am amazed at how many others don't do Facebook or other social media. Like Sherry I can only hope to win. We love Harvest Hosts. Stay at some fantastic wineries. Two of our favourites are Bernardo Winery in California and Del Monaco Winery in Tennessee. Another similar program is boondockerswelcome.com. Unfortunately I am way too antisocial to spend a night in some stranger's driveway. I have fewer qualms about a business, though, so I am in! Actually Dugg, you would have received the five extra facebook points just by being a fan to begin with. No need to "unlike" or "like" again. Great giveaway, thanks! We're about to take off for a couple months and are so excited to use our Harvest Hosts membership.